With all the flavor of Shrimp Scampi, but much less expensive, this fabulous main dish recipe uses boneless, skinless chicken breasts. I served it with Pesto Rice for a wonderful combination. Scampi is traditionally made of large fresh shrimp, cooked in butter, garlic, and lemon juice. It's an expensive dish and best made with very fresh shrimp. But for those of us who do not live next to the ocean or who don't have the budget to buy fresh large shrimp, using the same method to cook chicken breasts is a great alternative. Serve this wonderful recipe with hot cooked rice or pasta to soak up the delicious sauce. All you need to serve with it is some toasted garlic bread or cheese bread, a green salad tossed with sliced mushrooms and baby peas, and a glass of white wine. Sprinkle the chicken with salt and pepper and cut into strips; set aside. In a large skillet, melt the butter over low heat. Add the onion and garlic; cook until tender, about 5 to 7 minutes, stirring frequently. Add the chicken strips to the skillet and increase the heat to medium. Cook and stir until the chicken is cooked through to 165°F, about 4 to 6 minutes. 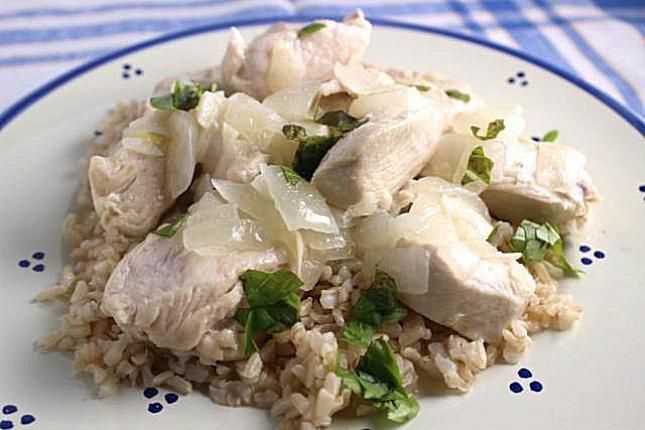 Stir in the lemon juice, lemon peel, and parsley and serve immediately over hot cooked rice or a rice pilaf.